Any time you are picking up your MaineCard you will always need to show an actual valid ID (driver license, government issued passport, or high school ID). We cannot accept a picture of an ID that may be on your phone or personal device. Access, Services, Convenience and More! The MaineCard is the official University of Maine ID. Eligible and valid cardholders include full- or part-time students, faculty and staff. While you are associated with the University, the MaineCard is the only card you will need to access facilities, services and optional spending accounts while on campus! Optional spending accounts include Dining Funds and Black Bear Bucks. New MaineCard and classic MaineCard information! 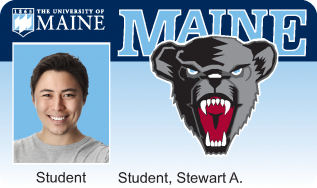 Starting this summer with incoming new students and new employees, the MaineCard Service Center will issue a new design with the black bear logo for official University of Maine ID. What does this mean for classic MaineCard holders with the current Stevens Hall design? No worries; it’s still good. Check out our detailed guide to your new MaineCard design!